Baldock Town continued their impressive unbeaten league record on Wednesday evening with a comfortable 3-0 home victory over local rival's Langford which will be remembered for Jack Mordecai's secord half strike from outside of the box which is a clear goal of the season contender. Aside from a few chances created by the away side it was Baldock who dominated the game from start to finish. Alex Coppin scored in the third minute (not captured on camera unfortunately as I was late arriving) and after Mordecai's goal it was the impressive Josh Coley who rounded things up with a close range finish. It could of been more if it weren't for the cross-bar (twice) and if Luke Gregson's side had been a little more clinical in front of goal it would of been a victory by a bigger margin. 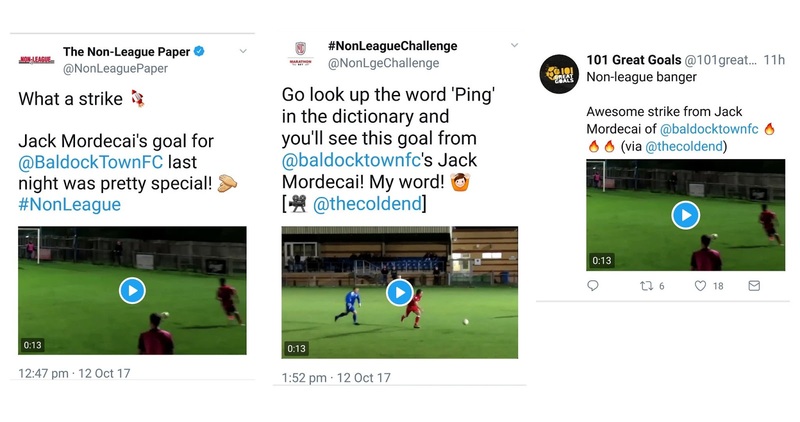 At the time of writing Mordecai's goal has been viewed over 5,800 times on twitter via @thecoldend and has also been shared on @101greatgoals, @NonLeaguePaper and @NonLgeChallenge with the headlines 'WHAT A STRIKE' AND 'GO LOOK UP THE WORD "PING" IN THE DICTIONARY'. The Non-League Paper has also shared it on Facebook where it has been viewed over 600 times. Below are highlights of the game aside from the afformentioned first goal. Baldock host Broadfields United on Saturday with Langford on the road to Risborough Rangers looking to get back to winning ways after losing their last three league and cup games.